How can I be sure that the patient has gallstones/acute cholecystitis? Biliary colic is caused by obstruction of the outflow of bile from the contracting gallbladder in response to vagal stimulation and the hormone cholecystokinin (CCK). Acute cholecystitis is caused by persistent obstruction of the cystic duct by a gallstone. As flowing bile is aseptic but not sterile, this obstruction leads to infection of the gallbladder, typically with enteric organisms. Risk factors for gallstones include blood dyscrasias (pigment stones), being female, multiple pregnancies, obesity, age more than 40 years, somatostatin analog therapy, TPN-dependence, previous ileal resection, Western diet, and rapid weight loss or prolonged fasting. There are also underlying genetic factors; the prevalence of gallstones nears 100% in certain Native American tribes. Symptoms consistent with acute cholecystitis include epigastric or right upper quadrant pain, often referred into the right flank or to the right shoulder and scapula (Kehr’s sign), nausea and/or vomiting, and anorexia. These symptoms classically occur 30 min to 2 hr following a meal that is typically but not necessarily high in fat content. As opposed to symptomatic cholelithiasis, with acute cholecystitis the pain should persistent greater than 6 hrs. The presence of fever higher than 101.5 F or 38.8 C defines acute cholecystitis from symptomatic cholelithiasis, but the absence of fever does not exclude the diagnosis of acute cholecystitis. Physical findings should include tenderness to palpation in the epigastrium and right upper quadrant. A palpable mass may be appreciated in patients with a thin abdominal wall. Inability to deeply inspire during deep palpation of the right upper quadrant is often observed (Murphy’s sign). The presence of scleral icterus or frank jaundice makes the diagnosis of acute cholecystitis unlikely. Importantly, approximately 90% of patients with gallstones are asymptomatic. Thus, patients with gallstones will present with abdominal pain that is not due to the gallstones, and consideration of alternative diagnoses needs to be maintained. There is no need for treatment of asymptomatic patients, regardless of other medical conditions. See Table I (Less typical clinical presentations of cholecystitis) and Table II (Differential diagnoses). 1. Acalculous cholecystitis Ischemic in origin, most typically observed as a complication of cardiopulmonary bypass or shock. 2. Chronic cholecystitis Long-standing intermittent pain, typically exacerbated by meals. Most typically diagnosed by histological evidence of chronic inflammation in surgical specimens of patients with symptomatic cholelithiasis. Not due to acute occlusion of the cystic duct. 3. Hydropic gallbladder Chronic occlusion of the cystic duct. The gallbladder is filled with clear, water-like fluid. 4. Mirizzi’s syndrome Chronic cholecystitis with retraction and fibrosis of gallbladder leading to hepatic duct occlusion, or due to a large stone in the cystic duct, causing compression of both cystic duct and common hepatic duct. Thus, patients present with obstructive jaundice. 5. Falsely positive ultrasound in the setting of cirrhosis. Cirrhosis can lead to thickening of the gallbladder wall and ascites without occlusion of the cystic duct, infection, or symptoms. 1. Cholangitis Suspect with significant elevation of bilirubin (total bilirubin >3), rigors, signs of sepsis. Can rapidly progress to shock and death. 2. Pancreatitis Epigastric pain through to the back. Nausea and vomiting. Amylase/lipase levels should be elevated. 3. Peptic ulcer disease Epigastric pain radiating to the back. Pain relieved with eating but then recurs. May have melena or guaiac-positive stools. 4. Gastritis Epigastric pain, vomiting, loss of appetite, and feeling of satiety after small meal. Can be chronic or acute in nature. 5. Neoplasm Variable origin including gastric, hepatic, gallbladder, pancreatic, duodenal, or bile duct. Insidious onset of symptoms and/or history of unintentional weight loss is concerning. 6. Viral hepatitis Acute swelling of the liver capsule can mimic symptoms of acute cholecystitis. 7. Liver abscess Unusual, typically diagnosed upon evaluation of primary pathology including diverticulitis or perforated appendicitis. 8. Budd-Chiari Acute thrombosis of the hepatic veins. New onset of ascites, pain, markedly abnormal liver function tests. Surgical emergency. 9. Hepatic adenoma with spontaneous hemorrhage Absence of fever, acute anemia, shock. 10. Symptomatic abdominal aortic aneurysm A pulsating mass may be palpated but is usually diagnosed with ultrasound or CT.
11. Mesenteric ischemia Pathognomonic feature of abdominal pain out of proportion to the physical exam. 12. Myocardial infarction May present with epigastric pain and can also have associated nausea and vomiting. 13. Right lower lobe pneumonia Pain with respiration, cough. Lack of anorexia. 14. Pyelonephritis Costovetebral tenderness greater than abdominal pain. 16. Appendicitis or diverticulitis May completely mimic symptoms and physical exam but are differentiated by imaging. 17. Fitz-Hugh-Curtis syndrome Pelvic inflammatory disease presenting as right upper quadrant pain. Blood work should include a complete blood count with differential liver function tests, serum amylase and/or lipase, and an abdominal ultrasound. A leukocytosis, or elevated percentage of premature white cells (bands) or neutrophils should be present. Pericholecystic hepatitis may lead to modest elevations in liver injury tests including the AST, ALT, alkaline phosphatase, and bilirubin. Uncomplicated results include positive sonographic Murphy’s sign, gallstone impacted in neck of gallbladder, or gallbladder wall thickening. Complicated results include fluid around the gallbladder or abscess, gas in the gallbladder wall or lumen without prior ERCP, or asymmetric wall thickening suggestive of malignancy. The presence or absence of intra- and extra-hepatic bile duct dilation is well assessed by US. Hepatobiliary iminodiacetic acid (HIDA). A positive HIDA scan is highly specific for acute cholecystitis in the absence of severe liver dysfunction. Most patients with acute cholecystitis will not require a HIDA scan. The test consists of intravenous injection of technetium-labeled iminodiacetic acid that is taken up by the liver and excreted into the biliary tract. Nonvisualization of the gallbladder (within 4 hr) is diagnostic of cystic duct occlusion. (See Figure 2.) A CCK-HIDA has also been used as a diagnostic test gallbladder and biliary dyskinesia. In this setting, the gallbladder is visualized and radiotracer quantitated prior to and following the administration of CCK. 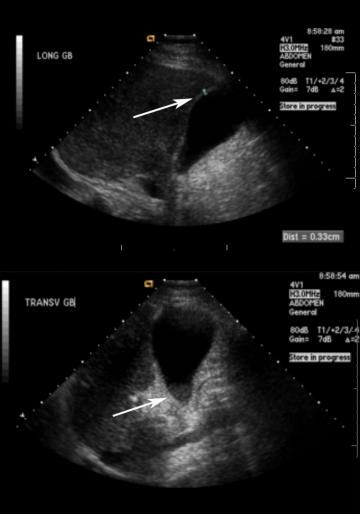 Biliary dyskinesia is diagnosed if the majority of radiotracer remains in the gallbladder (typically <20% ejection fraction, although some authors advocate up to 40% ejection fraction as diagnostic). Computerized tomography (CT). As up to 80% of gallstones are radiolucent, CT is not the diagnostic test of choice for biliary tract disease. However, it is appropriate to further evaluate ultrasound findings suggestive of possible malignancy or if the presenting symptoms place a diagnosis best evaluated by CT above biliary tract diagnoses (i.e., nephrolithiasis). Typical findings of acute cholecystitis include gallbladder distention and wall thickening, and pericholecystic inflammation. Magnetic resonance cholangiopancreatography (MRCP). Typically reserved for evaluation when choledocholithiasis is suspected (bilirubin >3) as a noninvasive assessment to justify ERCP. Esophagogastroduodenography. Diagnostic modality of choice for peptic ulcer disease or gastritis. Endoscopic retrograde cholangiopancreatography (ERCP). Role is limited to diagnosis and management of choledocholithiasis or complications of cholecystectomy. Assimilate medical history, physical exam, liver function tests, and right upper quadrant ultrasound. Obtain an HIDA scan if acute cholecystitis is suspected but not confirmed by the above. CT scan is appropriate for diagnostic uncertainty or to further evaluate unusual ultrasound findings (i.e., biliary dilation, asymmetric gallbladder wall thickening, liver or other mass, fluid collection). Cholangitis requires GI consultation. Emergent ERCP may be warranted. Admission and timely cholecystectomy are the treatment of choice. Symptoms in excess of 4 days favor delayed cholecystectomy. What other diseases, conditions, or complications should I look for in patients with gallstones/cholecystitis? What is the right therapy for the patient with cholecystitis? The right therapy is cholecystectomy. Early cholecystectomy is the most effective initial therapy. Other approaches including lithotripsy, dissolution, and surgical extraction of gallstones without cholecystectomy have proven ineffective or even harmful. 1. Delayed cholecystectomy. In patients in whom cholecystitis presents late in the disease course, after approximately 4 days of inflammation, the risk of complications from cholecystectomy are markedly increased; thus, initial treatment should be intravenous antibiotics with a spectrum that covers enteric organisms. Cholecystectomy is performed 6 weeks later, or for clinical failure of antibiotic therapy to resolve symptoms. 2. Cholecystostomy. Image-guided drainage of the gallbladder is appropriate when the risk of cholecystectomy is prohibitive and there is clinical failure of antibiotic therapy. How should I monitor the patient with cholecystitis? 1. Post-cholecystectomy or “bile salt” diarrhea. Typically, the patient complains of diarrhea ever since surgery. Clostridium difficile infection must also be considered. Treatment is empiric administration of cholestyramine for 6 months. 2. Biliary stricture. Thought to be the result of an ischemic event or thermal injury to the common bile duct. Can present up to 5 years after surgery. 3. Retained common bile duct stones. Presents within 2 years of surgery. Later presentation is attributed to primary common bile duct stones. 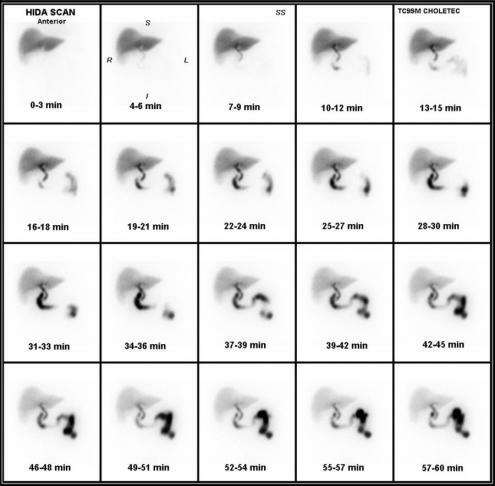 Routine intraoperative cholangiography has revealed that approximately 10% of patients without biliary dilation or hyperbilirubinemia have stones within the common bile duct at time of cholecystectomy. Only 1% will develop symptoms; thus, 90% of these gallstones pass without incident. If a post-cholecystectomy patient presents with jaundice or abnormal LFTs (alkaline phosphatase is the most sensitive marker), a CT scan may be of value to assess arterial anatomy and the status of the biliary tree, but most patients may proceed directly to ERCP for diagnosis and initial treatment of these complications. Csikesz, NG, Tseng, JF, Shah, SA. “Trends in surgical management for acute cholecystitis”. Surgery. vol. 144. 2008. pp. 283-9. Rodríguez-Sanjuán, JC, Arruabarrena, A, Sánchez-Moreno, L. “Acute cholecystitis in high surgical risk patients: percutaneous cholecystostomy or emergency cholecystectomy?”. Am J Surg. 2011 Oct 12. Charalel, RA, Jeffrey, RB, Shin, LK. “Complicated cholecystitis: the complementary roles of sonography and computed tomography”. Ultrasound Q. vol. 27. 2011. pp. 161-70. Banz, V, Gsponer, T, Candinas, D, Güller, U. “Population-based analysis of 4113 patients with acute cholecystitis: defining the optimal time-point for laparoscopic cholecystectomy”. Ann Surg. 2011 Aug 3. Sheffield, KM, Ramos, KE, Djukom, CD. “Implementation of a critical pathway for complicated gallstone disease: translation of population-based data into clinical practice”. J Am Coll Surg. vol. 212. 2011. pp. 835-43. Riall, TS, Zhang, D, Townsend, CM. “Failure to perform cholecystectomy for acute cholecystitis in elderly patients is associated with increased morbidity, mortality, and cost.”. J Am Coll Surg. vol. 210. 2010. pp. 668-77. Gilo, NB, Amini, D, Landy, HJ. “Appendicitis and cholecystitis in pregnancy”. Clin Obstet Gynecol. vol. 52. 2009. pp. 586-96. **The original author for this chapter was Steven J. Hughes. The chapter was revised by Dr. Bruce R. Bacon.